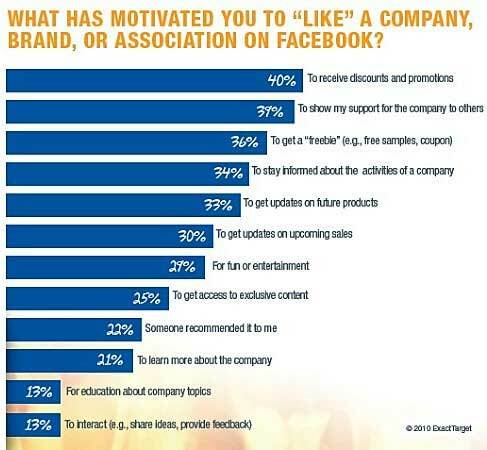 Though consumers turn to Facebook primarily to connect with friends and fill downtime, product discounts and "social badging" are the most commonly cited motivations for "liking" brands on Facebook, according to a survey from ExactTarget and Co-Tweet. Over two in five surveyed Facebook users (43%) say they "like," or are fans of, at least one brand on Facebook. Among them, 40% say they like brands to receive discounts and promotions, whereas 39% say they do so to publicly display their brand affiliations to others. By contrast, 23% of consumers who follow brands on Twitter do so for social-badging purposes. Roughly one-third of Facebook users say they like brands in order to stay informed about company activities (34%) and get updates on future products (33%). However, "liking" doesn't always lead to buying. Among Facebook users who like at least one brand, only 17% say they're more likely to buy after liking that brand on Facebook.